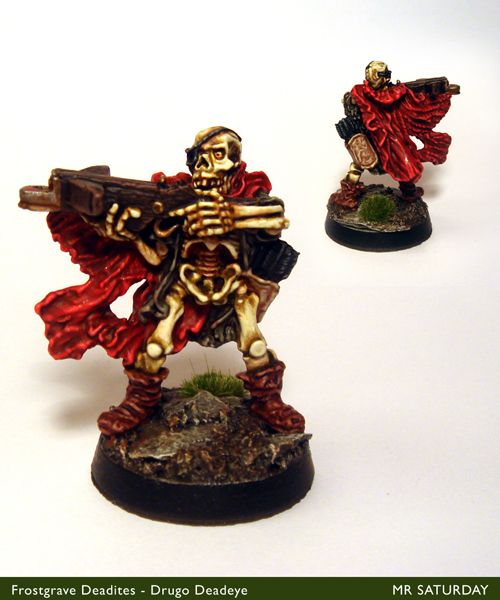 Here we have Deadite number two, Drugo Deadeye, who will serve in the warband with his enormous crossbow. He's a Bob Olley sculpt. I'm using as many Olley undead as possible, as they work particularly well for Deadites I think. 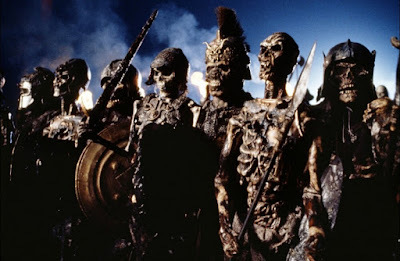 Look at the picture from Army of Darkness below. How Olley are these guys? 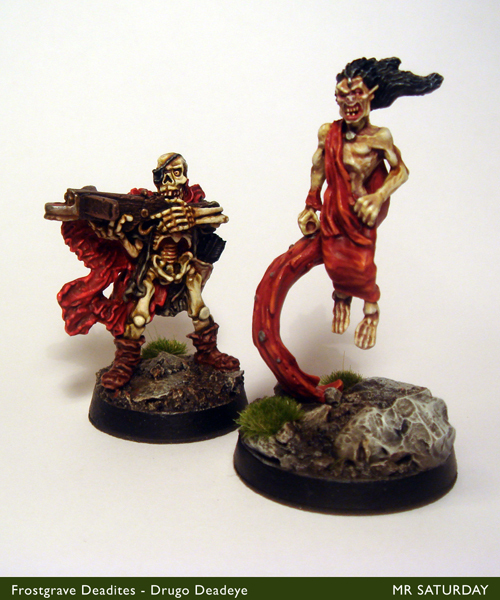 That makes for two Deadites finished, so a ways to go yet. Next up will most likely be another Olley skeleton, an archer, with an equally massive weapon. I've dug up some treasure tokens too (see what I did there? I am the funny. ), and by pure coincidence, they are mostly Olley as well. I seem to be all about Bob of late. Over the last year or so I've been crossing the divide into miniature design, providing concept art for several new miniatures. 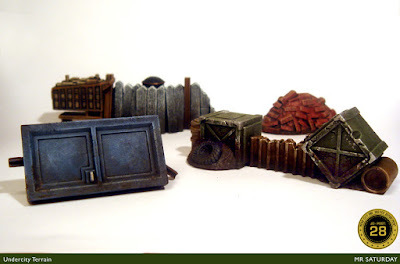 I really get a kick out of seeing a concept of mine turned into a three dimensional object, and the idea that these miniatures will be gracing gaming tables for years to come gives me a little glow. One model I've particularly enjoyed seeing move through this process has been the Dire Grem for Macrocosm. The Dire Grem is part of the Grem Alliance, which have just been released. Essentially a sci-fi troll, it's not something I had seen done before, so it was great fun coming up with one. Added to that the sculpt was created by Diego Serrate, one of my favourite modern sculptors. Seeing the concept pass through his hands into a green was a pleasure. The final painted versions you can see here below, with some of the variant heads. With their release, this trio of hungry nutters is now off into the wild to join armies and warbands in need of some muscle. Sniff! They grow up so fast! Heavily armed, and not a braincell between them. Okay, before reading on, listen to this for some mood music. 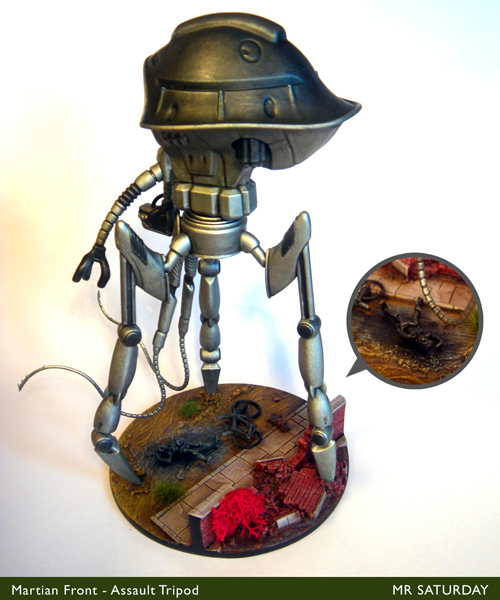 The first miniature finished for 2016 is a Martian Assault Tripod from All Quiet on the Martian Front. I love War of the Worlds, so when this appeared I was all over it. It's a very tall model, it's about 6" or so, on an 80mm base. It was easy enough to assemble, but those reaper tentacles at the front are spindly and require care when snipping them off the sprue, and pretty much whenever you're doing anything with them. It'll be fun to transport. I used a Gladius Game Arts base for this guy, and added a bicycle from a Sgts' Mess bits pack. The burned skeleton is from another All Quiet model. as for painting, a can of silver spray is a bit of a must. 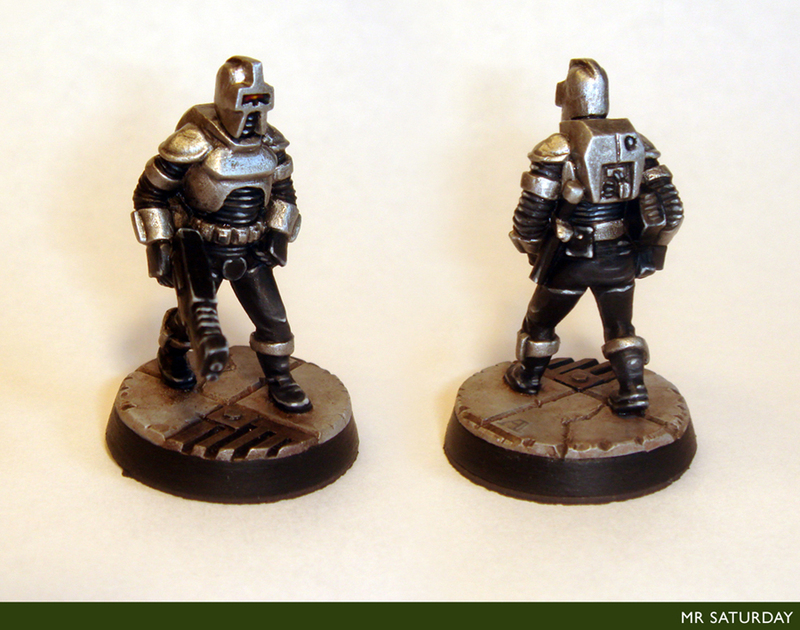 I used the Army Painter spray as a base over a black undercoat. Some folks use the army painter sprays as undercoats too, but I've heard the adhesion isn't what it should be. After a wash of thinned Nuln Oil, I used mostly recess washes and glazes to work up the model. 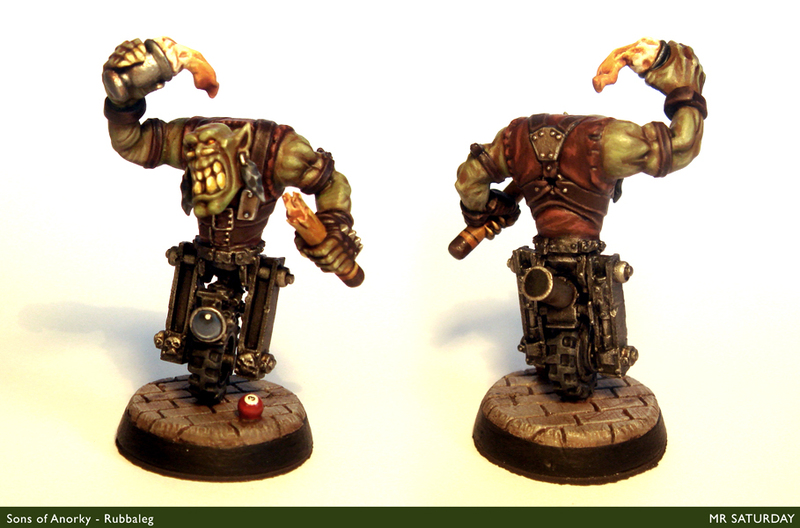 Painting larger models requires less contrast than smaller models, so again, I used acrylic medium to thin the glazes. Then basing. I had to do a little research for the burnt patch of ground under the skeleton. As the model is mostly neutral colours, I could get away with more vibrant base colours, hence the dirt road has a richer tone than I would normally use. 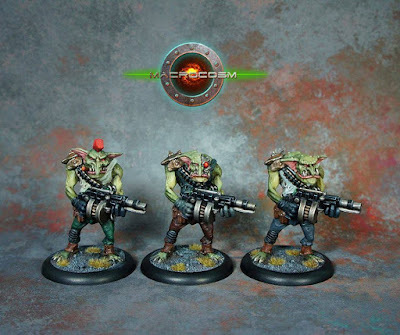 There are two more weapon variants on the assault tripod sprue, a black smoke projector and a green gas launcher. I'll be doing a tripod with each in time to finish a pod of three tripods. Then maybe some scout tripods or a harvester. As Alien Dungeon, the maker's of All Quiet seem to have vanished without trace just before Christmas, all models for the game are currently OOP. 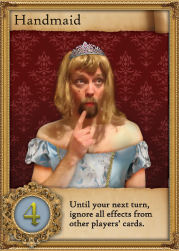 A shame for the backers of the kickstarter, but hopefully someone will pick up the game in time. So, the coffin lid on another year in the hobby is nailed shut and a new year rises. 2015 was a big year in the hobby, both for my own efforts and the hobby in general. The grand old institution that was Warhammer was finally holed below the waterline, listing briefly before slipping below the waves. I'm still smarting over that one. Age of Sigmar continues to whisper soothing words that it's all fine, but the wounds keep opening. That said, I'm not dismissing it out of hand just because Games Workshop annihilated the entire Warhammer setting, with over thirty years of depth to it. No I'm NOT BIT- okay, sorry, sorry, deep breaths... deep breaths. Anyhow. 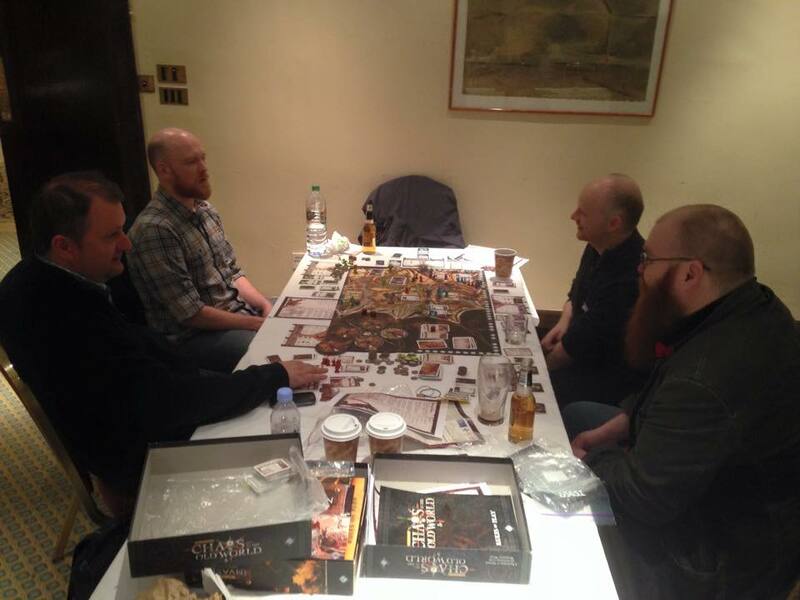 The explosion of boutique gaming companies continues apace, with almost every hobby taste catered for. Wanton destruction of venerable settings aside, we live in a hobby golden age. Even my own every increasingly niche tastes are overwhelmed with options. I crossed the counter over into miniature design myself this year, seeing my own concept art turn into finished models, both for small private commissions and production models. That's a big, big tick on the bucket list. More of that kind of thing. So, here's a bit of a lowdown on the year in the Mumblings. First up, the painting. 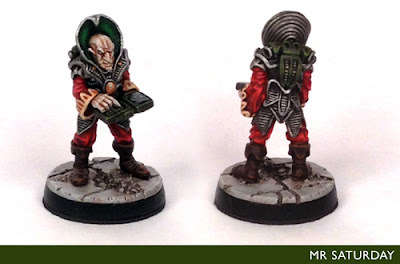 With some Pulp Alley gaming kicking off the year in January, it gave me some new year mojo to continue my work on the genestealer cult. 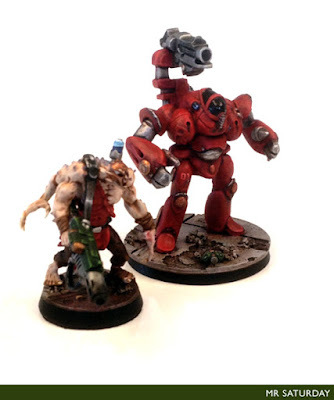 After an epic search, I managed to assemble a collection of Rogue Trader robots. 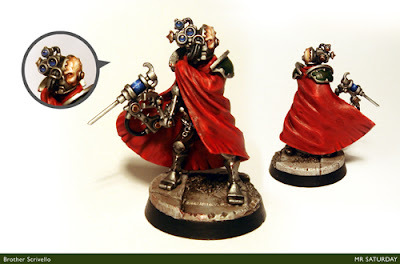 I painted my favourite, the Castellan, along with brother Char here. I had initially planned to use those masks on my brood brothers, a plan I've since half abandoned, but I like it on Char here. March saw me paint up Hierarch Mijur, a rare-ish Bob Olley sculpt. He will be the controller for the cult robots. The rest of the Rogue Trader robots are in storage awaiting some paint after furiously pursuing them all over the internet. An arm here, backpack there. After all that effort, I really need to paint the rest up. I have so many magus' now they could form a darts team. 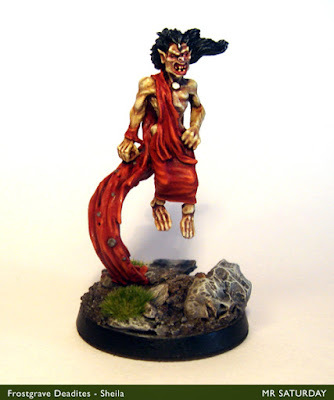 I'm half thinking of running a magus only Pulp Alley league for funs, though I still have a lot of cult minis to paint before I can indulge such fancy. 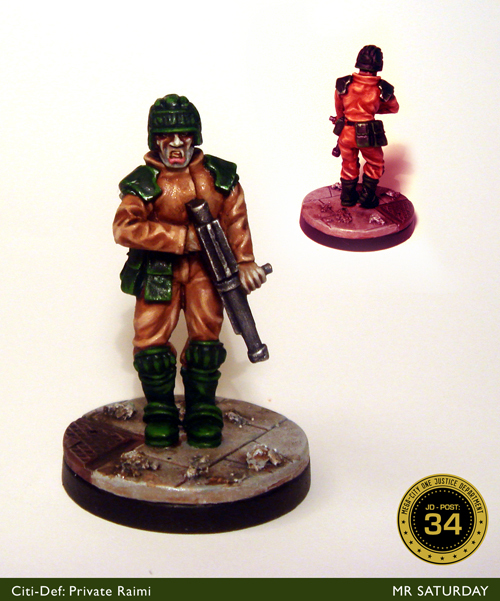 I'm a big fan of the model range for All Quiet on the Martian Front, (more on that later) so I decided to start painting some stuff for that. 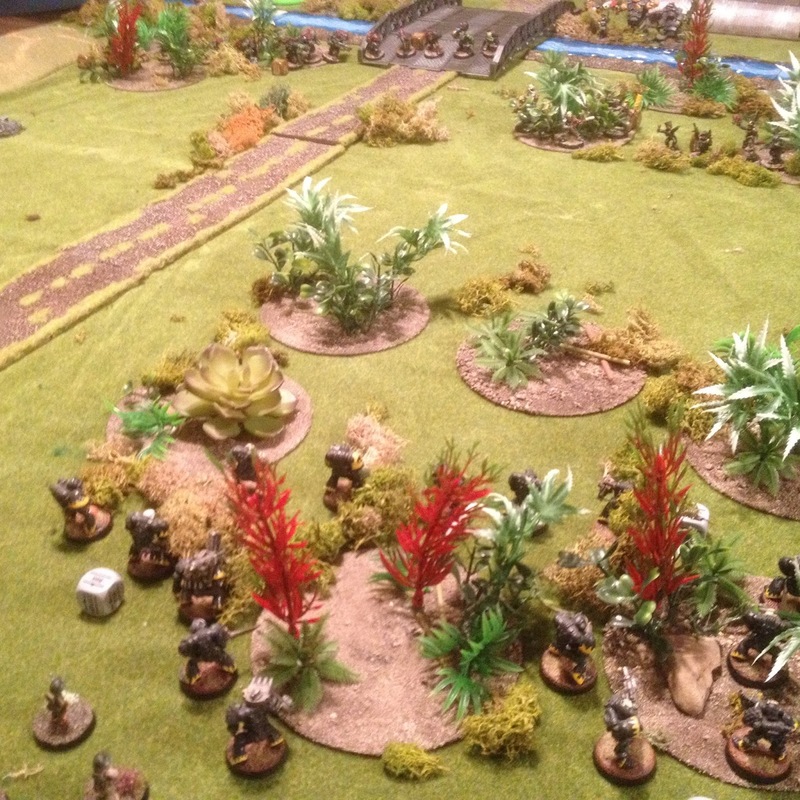 Three drones kicked off my Martian forces. Really fun working on these guys. 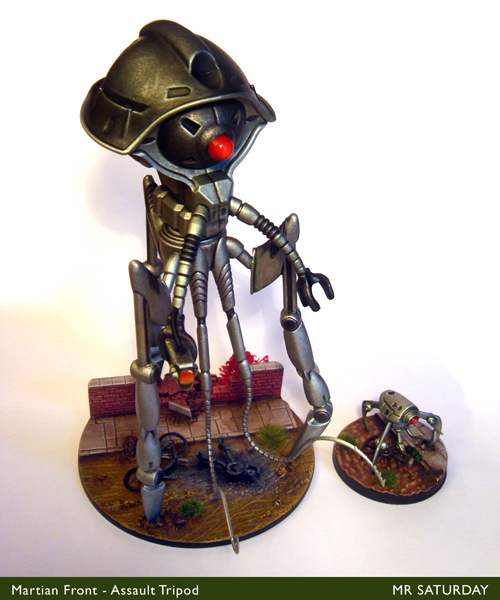 I used silver spray basecoat for the first time, a real time saver for my Martian colour scheme. April saw me discover the rather splendid Macrocosm range. 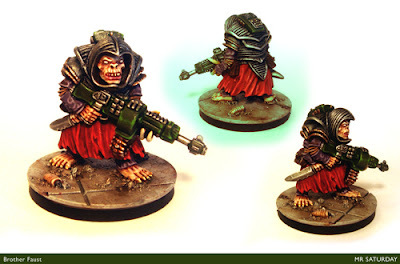 With so many useful models for the cult, it wasn't long before I purloined one to test my cult colour scheme on. I've since procured a lot more of these lads, called 'The Malignancy' in Macrocosm. There are some special weapons hybrids on the table right now, in fact. The end of April saw the start of a joint project between myself and Cheetor from Sho3box, Judgement Day.We're both avid 2000AD fans, in particular Judge Dredd. 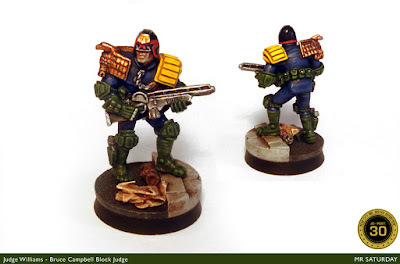 I had some Dredd minis, and I'd been eyeing several sets from the Judge Dredd miniatures game for some time, so it was decided we would dive in, posting a Dredd themed mini on alternate Mondays. So far this has worked out exceptionally well. Here's my work on the project for this year. The project served to increase my output, which can be erratic, and give me a huge boost to my painting mojo. My initial objective was to paint as many Sov Judges as I could get my hands on. 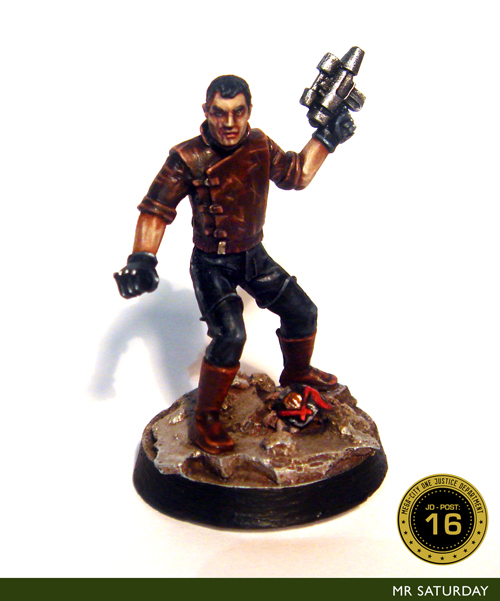 Having painted my way through the range (though there are new Sov sculpts coming soon, huzzah!) 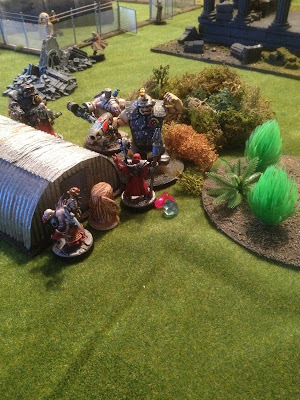 I then started an Undercity gang and an Apocalypse War resistance unit. These are just kicking off, but give me two good factions to paint during 2016, plus I hope to build a set of Undercity terrain. There are plenty of minis in the Dredd setting to hold my attention for years. Gangster Ape? Mutant raider? Zombies? Cyborgs? It's all there kids. After a holiday break, Judgement Day returns in February. With Judgement Day holding a great deal of my painting attention, I had little extra time on other projects, though I did manage a few. 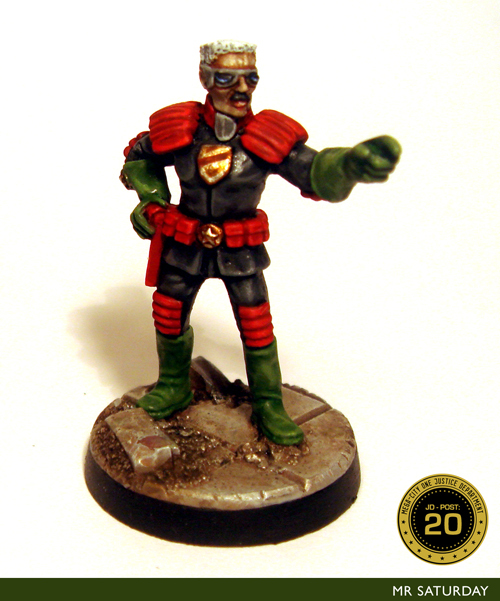 This fellow is the start of a force of cylons for Pulp Alley. 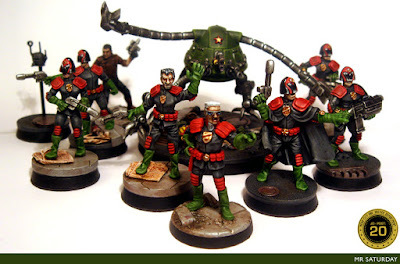 I have enough minis to paint up a decent amount of troopers and a centurion, plus a good stand-in for Baltar. I just need to convert up a Lucifer and I'm set. A definite to-do for 2016. This guy was a one-off for a game of Brewhouse Bash. See the post here. I converted up an ork brawler for the game. I don't paint many orks, but I can see I've been missing out. 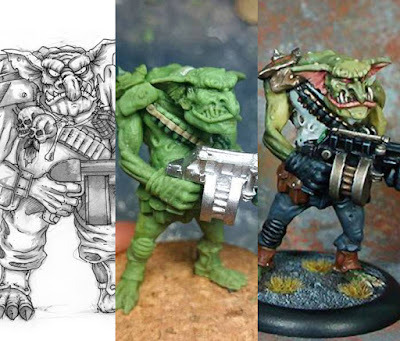 There may yet be additions to the Sons of Anorky. 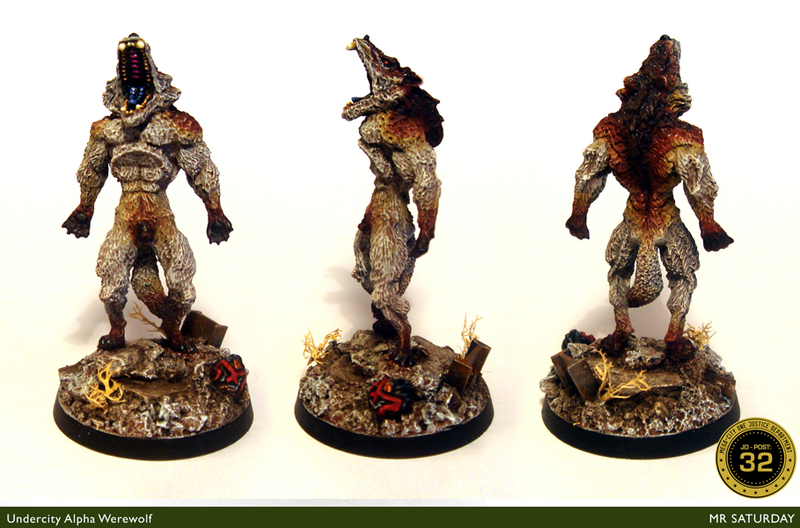 This chap came about from a competition to convert the Aenur model from Mordheim. I fancied a doctor/mechanic type for my cult, and so brother Scrivello was born. God bless those Adeptus Mechanicus plastic kits. Faust here is from a private commission. There are so few of this miniature it barely exists. Working on him was a huge tick on my bucket list, and I am very happy with how he turned out. Sheila here begins my Frostgrave Deadite warband. 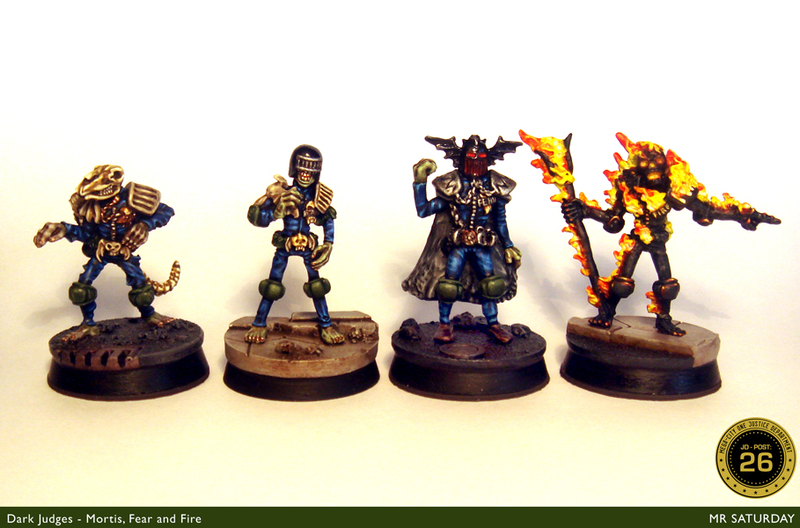 I have VERY specific models in mind for the rest of the warband, Bob Olley for the most part. I even have a Necronomicon treasure token on the way. I'm really excited about getting into this project this year, I haven't done anything fantasy in a while. That's it for the year's painting. 32 minis in total. Not as much as I'd like, but better than 2014. My aim is to double that this year. Gaming was pretty hot this year. I am lucky enough to have a few circles of gaming buddies, gents and saints to a man. At this stage I've distilled down to the die-hards. Good folks, and whose company pretty much guarantees big funs and tons of laughs. Here's to them. 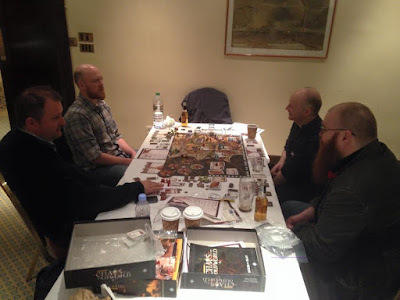 A selection of gaming photos to prove I'm not a loner in a cave in the mountains follows. Yup. Good times. Here's to more of that in 2016. Okay, so, this year. Well, with the death of Warhammer and the fracturing of the Warhammer community, it'll be an interesting year to see how things settle. 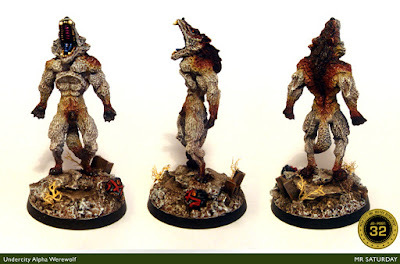 I've been keeping a somewhat heartbroken interest in Age of Sigmar developments, and I must say some of the models coming out interest me, especially the terrain. Some not so much. 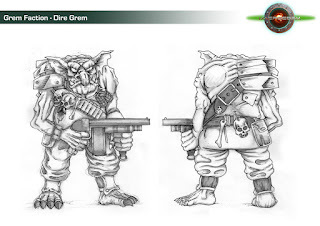 There seems to be a fairly strong dollop of the Warmachine/Hordes aesthetic creeping into the design. The new Varanguard are a prime example. 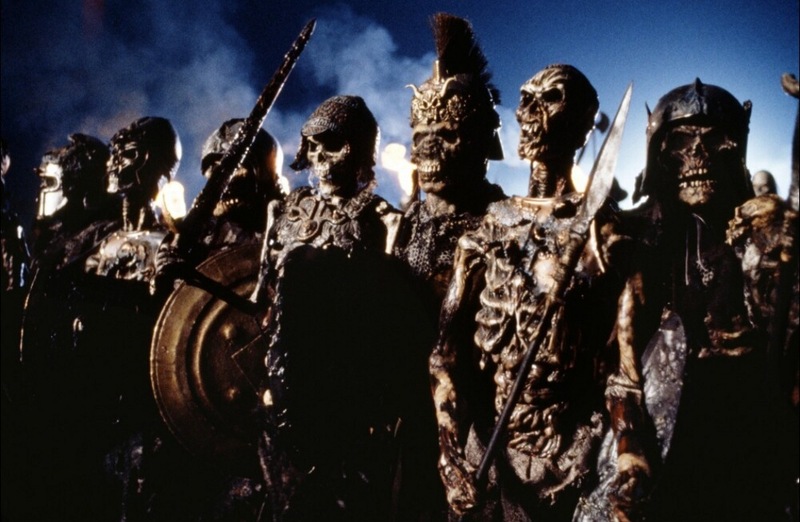 I'm interested to see how they treat races like the dwarves and undead with new releases. Once again my chaos dwarves are out in the cold, with a half-hearted set of warscrolls. 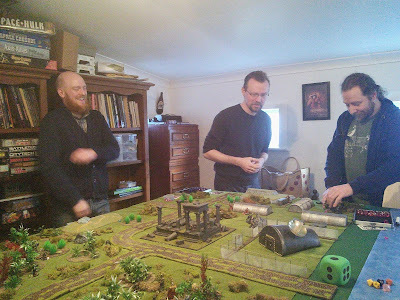 The Oldhammer scene is still as strong as ever, and continues to offer inspiration and entertainment to the lovers of the lead. It has spawned all kinds of sub-groups and projects, which is much to be lauded. Long may it reign. 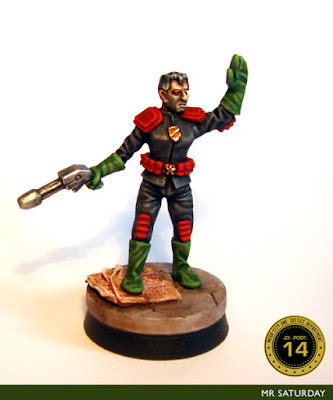 This year I hope to add some more Judge Dredd minis to the collection, try out some new fantasy rules and get some more Rogue Trader minis painted. 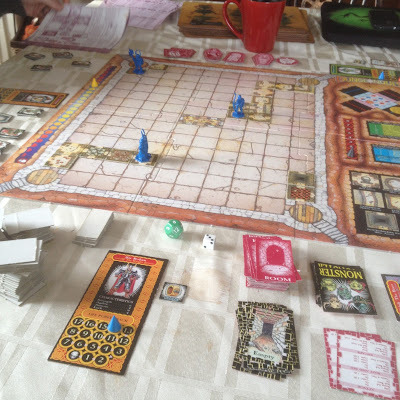 I'm intrigued by both Frostgrave and Dragon Rampant on the fantasy side of things. I need to get those fimir back on the table. For Sci-Fi, Pulp Alley still holds the top spot, and I have several new leagues planned, as well as adding to my genestealer cult. I'm also going to try to get some more All Quiet on the Martian Front models done this year. Sadly the company seems to have ceased trading, but hopefully someone will pick up the game. In the meantime I have plenty of All Quiet models to get on with. 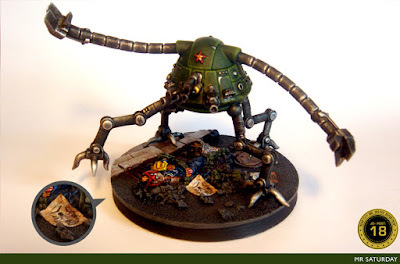 The first model of 2016 will be a Martian assault tripod in fact. A bigger model than I was anticipating, but fun to work on. So, with that I leave ye. A thank you to all the readers of the Mumblings, I hope you are enjoying my meanderings as much as I am. Happy new year to you all, may your bristles never become unseated.